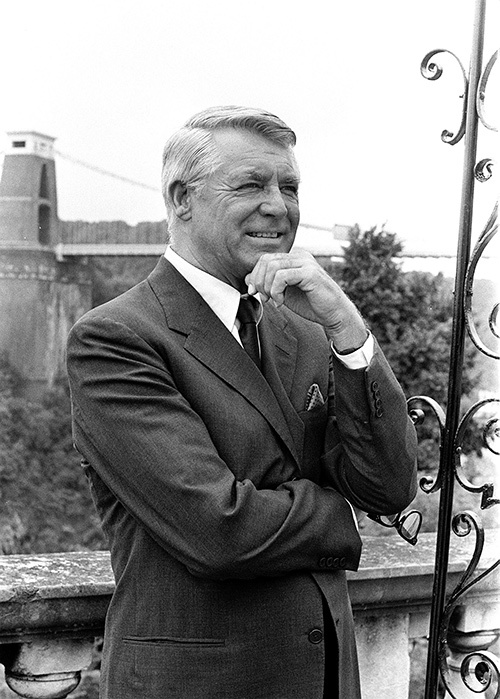 The life and work of one of Bristol’s most famous sons, Cary Grant, is being celebrated at the Harbourside in a special festival weekend, Cary Comes Home. Film screenings, talks and clips as well as fully-guided open top bus tours, making special mention of places associated with Cary Grant, will be running at regular intervals from Thursday 14 to Sunday 17 July. Guided tours will also be starting at 10.30am on Saturday 16 and Sunday 17, at the Bristol Hippodrome, the theatre where young Archie Leach got his first introduction to showbiz as a backstage call boy. There is a special screening of Alfred Hitchcock’s ‘ Notorious’ followed by a wine tasting at Averys Wine Cellars, on July 8, the weekend before the festival. Films shown during the festival include ‘ Only Angels Have Wings’, ‘An Affair to Remember’ and ‘Bringing up Baby’. Cary Grant enjoyed a career spanning six decades as a Hollywood film star and style icon that earned him numerous accolades, including a special Oscar, the title of world’s best dressed man and a place on a US postage stamp. He was connected to many of the best known figures of the 20 th century, among them, Mae West, Elvis, Sinatra, Sophia Loren, Louis Mountbatten, Ronald Reagan and the Kennedys, and he was a millionaire many times over. However, he never forgot that it all began in Bristol, the city of his birth and a place to which he returned time and time again. Born on January 18,1904 at 15 Hughenden Road, Horfield, and named Archibald Alexander Leach he was the only surviving son of Elsie Maria and Elias James Leach, a tailor’s presser. Elsie suffered severe postnatal depression as a result of the death of Archie’s brother and is sent to an asylum in 1910. Young Archie became a pupil at Bishop Road Primary School, Bishopston in 1908 and, briefly, at North Street Wesleyan Primary School, Stokes Croft. He won a scholarship in 1915 to Fairfield School in Montpelier but was later expelled. In later life, the actor recalled enjoying boyhood visits to the docks, dreaming of visiting faraway places in the big ocean-going ships he saw there. A lifesized bronze statue of the star, by Graham Ibbeson, was unveiled by Grant’s widow, Barbara, in Millennium Square in 2001. A chance visit to the Bristol Hippodrome changed his life. Taken by a teacher to see its new lighting system, Archie was so captivated that he took a pocketmoney job as a backstage ‘gofer’. Through this, he met Bob Pender, leader of a troupe of knockabout comedians and at the age of 14, Archie ran away to join the troupe. This move would eventually take him to the USA, to starring roles on Broadway, his first Hollywood contract and a change of name to Cary Grant. By 1935 Cary Grant had become famous; he was getting steady offers of roles and his co-stars include box office favourites such as Marlene Dietrich, Gary Cooper, Mae West and WC Fields. When his father died, he learnt the truth about his mother that contrary to what he was told aged 10, she was alive but in the Glenside mental hospital. A reunion followed and when Elsie declined to join her son in the States, he bought her a house in Linden Road, Westbury Park. From then until Elsie’s death in 1973, aged 96, he called or wrote to her every week and became a regular visitor, often flying in by private jet. For more information about the Cary Grant festival events, see www.carycomeshome.co.uk.